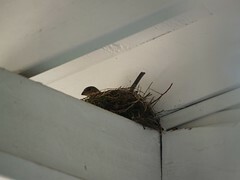 They couldn’t pick a busier spot, but every year birds nest in our front porch – and most every year the nest blows away. Hoping this year they’re successful. This entry was posted in Conshohocken, spencer's photos by Spencer. Bookmark the permalink.